Free Online Magazine Creator - 4 Steps? Mindblowing! Yumpu is free to use, and it does what it claims to. Since I started using it, it worked so well for me, that I did create a magazine and a catalog for my friend’s business. I have also used it to create flyers and design digital magazine. Everything that I tried with this software was easy to do, and it worked fantastically on desktop computers, smartphones and on tablets! 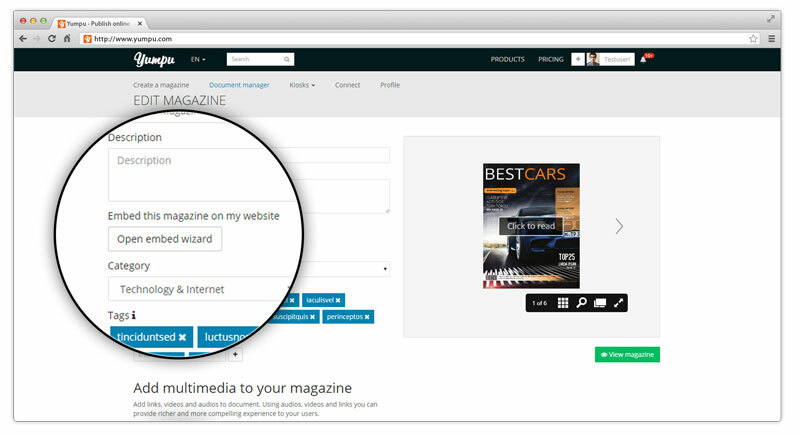 In this step by step guide, you will learn how to utilize this free digital magazine software in the best way possible. It won’t take long, just around 10-15 minutes and even shorter if you already have a finished PDF document to upload! 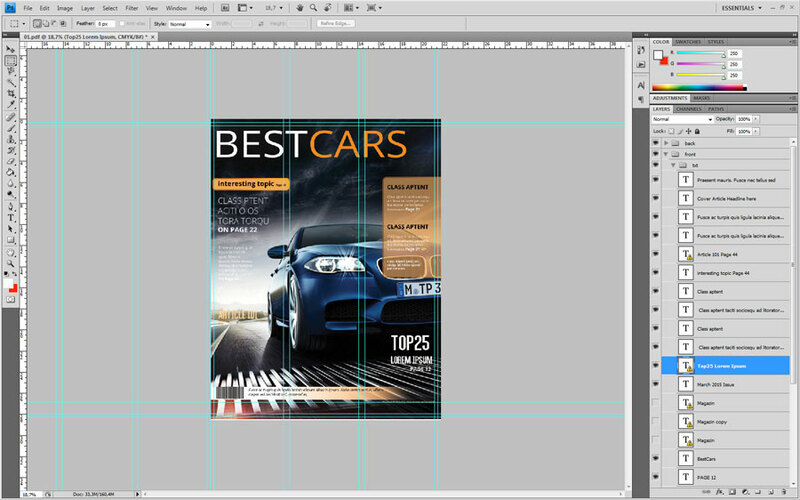 To make a magazine and create a design with this service, you need a PDF file in which your content is. If you already have a PDF file for your magazine, continue with step 2! When you are done editing the pages, save each single site (not double pages) as PDF files, by clicking on “File”, “Save as” and then at the file type choose “Adobe PDF”. After you got your multiple PDF files you have to merge them together, by using an online tool for example. I used this one: sejda.com. Remember to merge them in the right order. That’s it! Now you are ready to create your online flip magazine. Now let’s upload our PDF file to the magazine creation service. Open up this link (Yumpu.com) and then drag your PDF into the website. The PDF will then be uploaded. It may take a few minutes, depending on the size of your PDF file. When the upload is done, you need to create a new free account for the online magazine creator. Click on “Create a new account” and enter your e-mail address. You will then recieve an activation e-mail. Click on the acivatin link. You will then be asked to enter your username and password. After this step, your account is set up. Now we can take a look at our online magazine created with the e magazine software. 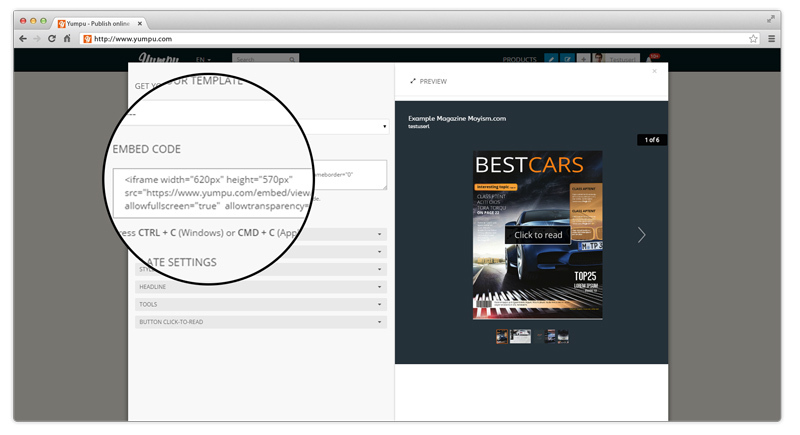 You can now edit your uploaded free digital magazines and add proper title, description and tags. This is important, because it leads to more views due to search engine optimization. An appealing title, with the main keywords of your digital magazine in it, a long and well written description and fitting tags lead to higher ranking in all major search engines, as well as in the Yumpu onsite search. The most important settings are right on the top of the page. Now add a title, description and tags. A few tags are always automatically extraced from the created magazine, if you don’t like them you can remove them by clicking on the “x”-icon. Also set the correct language, as this defines on which site (english, german, spanish, etc.) the magazine will be found and readable. If you want to use more functions, you have to get the AdFREE plan for 19.95 €/month. You pay only 14.95€/month if you select the annual billing cycle though. With that you can activate the download function, remove the branding or set privacy settings. With this page flip magazine creator, you can also embed the created magazines on any blog or website. 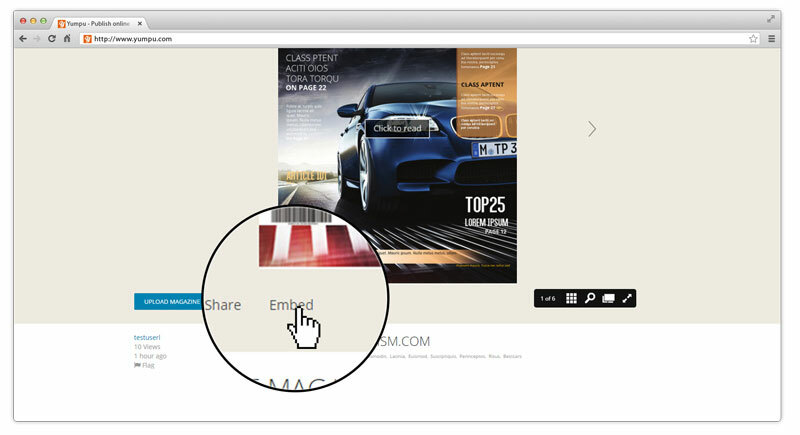 Open up your pdf page flip HTML5 magazine and click on “Embed” below the page flip magazine. That will open the so called Embed wizard. Choose the advanced embed widget (the best way to embed the whole magazine in our website to publish your own magazine online; has the most styling options). You can style the embed with the tabs on the left side. The most import tabs are “Size” and “Style”. When you are finished, hit the save button and copy the created embed code, as shown below. All that’s left to do now, is pasting the copied code into the HTML of your website. And there you have it. 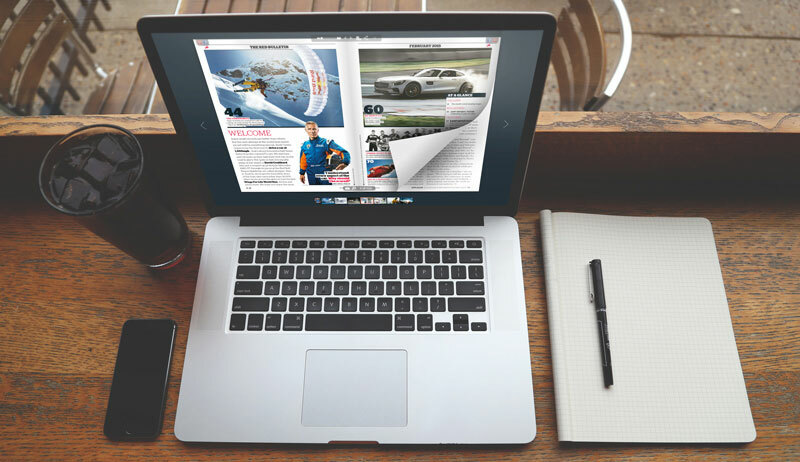 You created your own online magazine and embedded it in your website. Well done! Now go and play around with the tools of this best online magazine software a little bit more, there’s always more to learn and master. 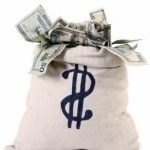 Online Magazine Creator – I saw the light! At one time, I was totally confused with all the software that is on the market. 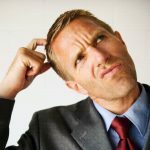 I didn’t know which one would work for all the various things that I needed to do in order to stay in the know, and help get my own business up and going. After trying so many different software programs, I came across the online magazine creator to publish my publication. It is free and easy to use. I gave it a try, and I am more than pleased with what it has done for me. If I ever have a question about, they offer fantastic customer service. They answer any and all questions that I have for them, and that makes my job so much easier Since they are available at all times, every day of the year, all day and night, it is easy for me to get the assistance that I need. Since Yumpu.com, the free magazine creation service, is used by many online publications, I can use it to read magazines, catalogs, brochures and more. It is free to use, and I can download it at any time, even from my cell phone. It makes life so much easier because I don’t have to constantly search for information, I can do it all when I use the software. 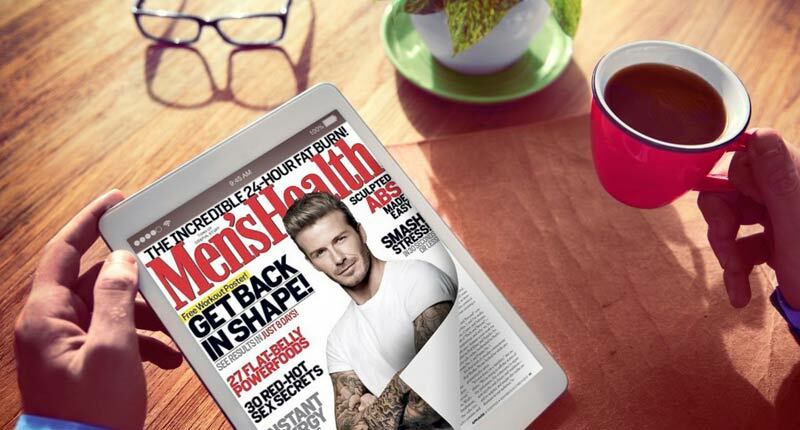 This free online magazine creator, is a newsstand / digital publisher platform, and it has millions of readers that check out over 20,000,000 magazines. There is quite a variety to choose from, like arts, sports, culture and more. It is so simple to use because all that you have to do is upload a simple PDF file. 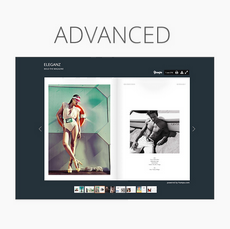 You will see the magazine displayed on a digital reader in full color. Remember, it is free, and the quality that it produces is excellent. The cloud hosts the magazine after it is uploaded, and this gives it a timeless longevity. This makes it so convenient when I need to find information readily. It has been a lifesaver for times when I need to gather the information that only comes out of so many publications. It is possible to use the flipbook from your desktop in your home or from you mobile device when you are out on the road. You will have access to the flipbook everywhere and anywhere that you might need to go. Yumpu.com, the free online magazine creator, is optimized for search engines. I was actually able to customize the flipbook to what I wanted, with my logo on the information. There are options at this software available to change the background colors too. I was able to embed it into my Facebook account and on my private website. Since one of the options is to add a video or sound bite into it, I did. It is a one of kind tool that gives me a lot of leeway, and I recommend it to other people that are looking for something that is free and easy to publish. I know that it benefited myself in so many ways, and it will help others to publish their documents too. More research showed me that the best way for converting with an magazine creator online, often, to use a file converter right on the internet. That idea lead to even more trouble for a while. It took me a while to find a site with all of the features that I needed when converting PDF to flash magazine format. Some of the sites I tried claimed that they did conversions from PDF to flash magazine automatically but when browsing the site it turned out to be just as complicated as doing it myself. With no customer support they did nothing to help me. Other sites had the automatic software but, like the publishing software on my computer, seemed more inclined to eat my work than convert it. Other sites seemed like they may work better but also seemed like they would end up costing a fortune in the long run. Even most of the “free trials” asked for my bank card information. I was beginning to lose hope in ever finding anything that worked. I was even considering hiring professional support to search an cool online magazine creator for me, despite the fact that I could not really afford it. Anything would be better than the profit losses I was suffering. That was when I finally discovered the solution. Ever since, converting my PDF to an online magazine has been a breeze. Not only is it simple to use and effective even if I do experience any difficulties they have a professional and helpful support team always at the ready. Those, along with many more features are completely free. It is simple and easy to start publishing. You simply have to create a free profile and get to work. I, personally, signed right in using a Facebook page without a thought about my card information or any worry I may be charged in the future. Best of all, by using the magazine creator online for free, I saw a dramatic increase in profits. Not only does the site have what I need to convert my files, it is fully social media integrated. That results in free advertisement for me through Twitter, Facebook and more of the major networking places on the internet. I went from struggling to keep my head above water with paper back to the success I used online magazine creator and directly publishing online. The internet and all the social media networks like facebook twitter and co. is defenitly the place to be. For conversion, publishing and exposure without the hassle there is no place I would advise over yumpu.com. I never made a better decision than to convert my PDF to flash page flip book , the site is what kept my publication from dying. Eddie, thanks for the article! I was looking for a free solution which makes it possible to create online magazines. I tried it and I have to admit, it’s really awesome. Easy to handle and I get stunning results. Exactly what I was looking for! I’m a web designer and in the past I used flash to create online magazines. But believe me, that was really a pita! This solution is godsend. I had a PDF document done and needed something to help me create a magazine based on it. I heard about Yumpu and decided to give it a try and see if it works or not. I was pleasantly surprised by the versatility and ease of use this has. Even I, who am not an expert in these matter found it quite easy to create a magazine with it. I managed to do it in less than 20 minutes and was very happy with the final result. Dont’ forget to share your finished magazines on facebook and twitter. This will bring in tons of free traffic! There are a lot of useful tools and sites on this page (both free and paid) and I will probably use them all since this is my first time doing this. Thanks for the tutorial on how to covert a word document to a PDF file! It was very helpful! Also graphicriver looks like a great place to get a nice looking template; I might give them a try. I will definitely use the Yumpu Online Magazine Creator since they seem to be so simple to use that even a kid (or me) can use it :)! Hi Dan, glad to hear that the tutorial was helpful.I can definitely recommend you Yumpu, it’s simple, fast and free. Man, I had to wait some time for that activation email to arrive! I don’t know what happened and why that didn’t arrive sooner but it took a lot of time to get there and ended up in my spam folder. Anyway, after that all was great. Yumpu is sooo easy to use and with this tutorial you’ve made things even simpler for me. I didn’t know the description is so important for the onsite search (thanks for mentioning it). Great article, thanks to you, Eddie! I got the AdFree plan for Yumpu because it was so cheap and I was tired of all those ads showing up plus I now have a lot more functions available and this makes it very worth it. I pay more for coffee in one month so this was a no-brainer for me! Even as a free service this is just amazing because you get so many cool features, but once you pay these few bucks it becomes a real beast of a tool! No problem 🙂 I hope everything goes well. Yumpu is a really great tool for online marketing! As we had signed up for this a while back, it’s been such a life-saver! And it really is a professional-looking catalog. We love it, as do our customers, who have given us rave reviews since we added this. Great to hear! Online catalogs work really well for online marketing and all that stuff. I’ve been recommended this by friends of mine who have used or are currently using. They can’t give it enough 5 stars. I will be taking a look at it, and see where it takes me. I had a pretty good experience with the tool. Let me know how you like it! As an owner of a small business that’s been in my family for years, I decided to up the stakes and go digital (to my folks’ chagrin), and the ease of installation and use is phenomenal. Would highly recommend to anyone who wants to reach more customers in style. Great product. This was the first thing we did as soon as our business was ready to launch, and I can’t imagine not having this. I love how you can add video and audio files (as we do tutorials on some of our kits) and the ease of updating your catalog, without the expense of paper, is a huge relief.